Her's ring feature square solitaire CZ stone about 2 carats with accented by couple smaller CZ on sides give extra sparky and radiant. Rose-gold-plated features its classic look which stand the test of time. Men's 8mm matching band features black stainless steel ion-plated stripe with multi round cubic zirconia. Amazing enriched cubic zirconia gives super sharp clarity. EXTRA SPARKY: Hers ring feature emerald solitaire CZ stone about 2 carats with accented by couple smaller CZ on sides give extra sparky and radiant. CLASSY STYLE: Rose-gold-plated features its classic look which stand the test of time. TARNISH RESISTANCE: Hypo-allergenic finish stainless steel will keep shines over years and will not turn your finger green. MEN'S RING: Men's 8mm matching band features round eternity cubic zirconia. Inner comfort fit design make it comfortable for wearing daily. Titanium is lightweight, hypo-allergenic and non-tarnish. 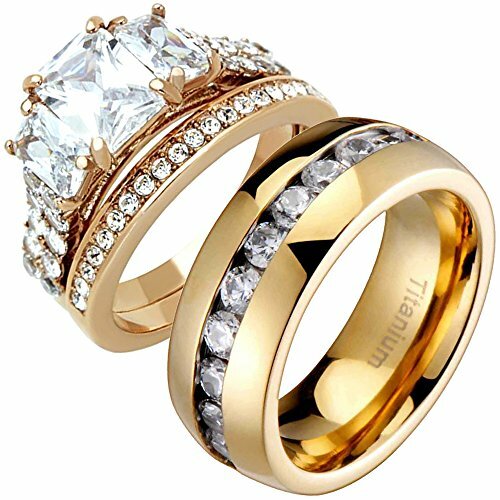 TOP QUALITY CUBIC ZIRCONIA: Amazing enriched cubic zirconia gives super sharp clarity. If you have any questions about this product by Cherish Loves, contact us by completing and submitting the form below. If you are looking for a specif part number, please include it with your message.